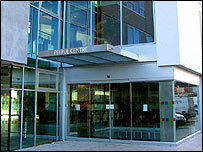 Managers at the Peepul Centre in Leicester have admitted work is needed to raise its profile. The £15m community and arts centre was opened 18 months ago but is already facing financial problems. Bosses have said they need up to £3m to cover running costs and that a lack of public awareness of the facilities is part of the problem. Once the centre's future is secure, they said they would look at properly publicising its services. Chief executive Rita Patel said: "This is for all the community and somehow we have failed to get the message out that different communities can come together here. "We must make sure that everybody knows it exists and it is designed for them to use." Managers said a mix of final touches to the building and start-up funds for on-site businesses meant they were looking at restructuring debts and finding additional investment. The bulk of the original funding came from the East Midlands Development Agency, Sport England, the Millennium Commission and Arts Council.